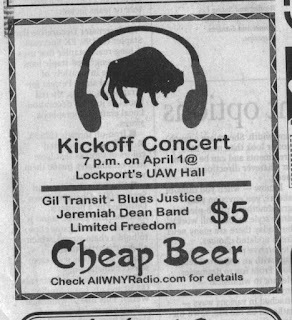 The 24/7 all-local music stream that is All WNY Radio kicked off 11 years ago today in the UAW Hall in Lockport with four bands and -- as you can see from the ad that appeared in the Lockport Union-Sun & Journal -- cheap beer. Eleven years later, we're still going strong, as made evident by our recent anniversary party at Stamps a week ago today. And we intend to keep going. All WNY Radio is irreverent, unfiltered and raw. All WNY News has tended to take things a bit more seriously -- but not too seriously, we hope. Since its inception, All WNY Radio has broadcast more than 96,000 hours of local music, news, comedy and talk radio. And in the past year, All WNY News has published 7,862 stories, an average of 21 stories a day (with a marked uptick in frequency since the beginning of 2017). Whether you've been there from Day One or just learned about us yesterday, know that we appreciate you joining us for this journey we're on. Because we've got a long way to go. And we intend to grow. If you're a musician looking for airplay, check this link out. If you're a writer, artist, photographer, commentator, or simply think you can contribute to the team in some way, send me an email. We're always looking to expand our boundaries. I could go on. But I won't. I'm sure you've got other things to read. And I heard rumors of cheap beer somewhere. +Scott Leffler is the founder of All WNY Radio, publisher of All WNY News, and fan of all WNY things. Tweet him @scottleffler or email him at scott.leffler@allwnyradio.com.